BEIJING - The story of a Chinese schoolboy who braved harsh winter conditions to get to school has triggered an avalanche of help for him and his school. A donation of 100,000 yuan (S$20,500) was sent to Zhuanshanbao Primary School in Zhaotong, Yunnan province, on Wednesday (Jan 10), after photographs of "Snowflake Boy" Wang Fuman drew widespread attention to children from poor rural families, China Daily reported. 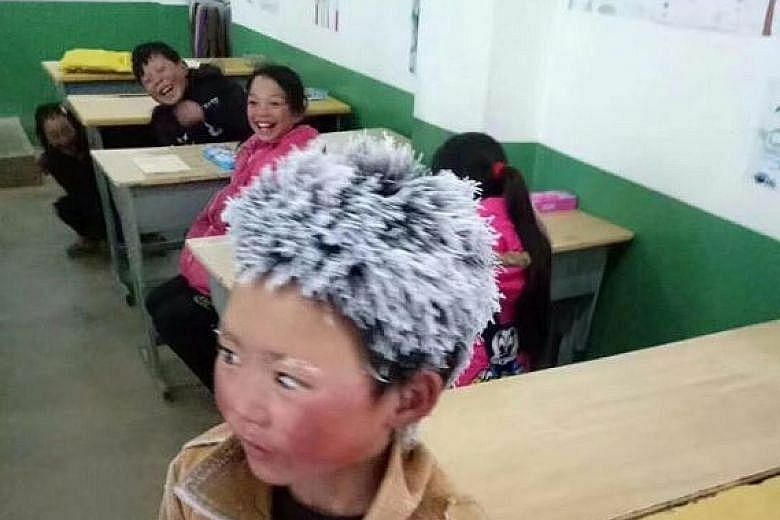 Photos of eight-year-old Fuman in class, shared by his principal Fu Heng on Tuesday, showed the icicles that had formed on his hair and eyebrows during his 4.5km walk in freezing temperatures to go to school. The Primary 3 boy had walked for an hour in minus 9 deg C conditions from his home to his school to sit an exam on Monday. Mr Fu said that it was the first day of the final examinations, and the temperature had plunged quickly within half an hour, while the boy was already on his way to school. The boy lives in a mud house in Ludian with his grandmother and older sister, according to an interview with social media site Pear Video. His family is supported by his father, who is a migrant worker in another city. The boy's mother has left the family. Other photos of the boy shared on social media showed his rough hands, which had turned dry and wrinkly. He also suffered from frostbite. The boy told Pear Video reporters that he helps his grandmother with farming work, resulting in his rough hands. He also said he missed his father, whom he had not seen for a few months. Many netizens were sympathetic to the boy's plight, with one Weibo user encouraging him to study hard to change his destiny. In an interview with Beijing News, published on Thursday, Fuman said he loves going to school and his favourite subject is mathematics. When asked by Beijing News why he went to school on Monday wearing so little, Fuman said: "I have three jackets but I didn't wear any of them because they were all dirty and not washed yet. "It's too cold to wash clothes by hand in winter, so I haven't washed the jackets." Fuman also said that his school has no heating facilities. The local government, along with volunteers, has since reached out to the school and distributed the first batch of winter supplies to the 81 pupils, China Daily reported. The Kunming branch of China Construction Third Engineering Bureau also donated 144 sets of winter clothing and 20 heaters to the school, according to Beijing News. Fuman's father was also offered a job in his hometown from the bureau, China Daily reported. In total, cash donations to help the boy and his school have so far reached more than 17 million yuan (S$3.5 million), according to China Daily. Readers of Singapore's Straits Times newspaper have also offered to help, after reading about Fuman's story. They have written in to find out how they could reach the boy. Fuman is among millions of children who live in poverty-stricken areas in China and his story has highlighted the issue of educational inequality in the country. Hungry for knowledge, students in rural areas often have to trek to a classroom that, in most cases, has no heating in winter. This contrasts with the tens of thousands of yuan that wealthy parents in first-tier cities spend on extra classes and summer camps for their children, the Chinese state-run tabloid Global Times said in an Op-ed column on Wednesday. The column argued that rural students, especially those left in the care of relatives by their migrant-worker parents, should be given more educational support. "Financially advantaged children have many options to thrive, but for rural kids, education is perhaps the only opportunity to climb the ladder of social status," said the Op-ed column. It added: "For poverty-stricken students, an educational background may directly affect their future jobs, salaries and working environment. More efforts should be invested to provide snowflake boys and girls with easier access to the educational resources on which they can rely to pursue better prospects." Fuman's father, Mr Wang Gangkui, told Beijing News that many people have offered to help the family after his son's photo went viral, but he does not want the boy to think that good things would readily fall onto his lap without having to work for it. Mr Wang wants Fuman to study hard and change his destiny through his own efforts. For Fuman, his biggest dream is to do well enough in school so that he can study in Beijing. When asked by Beijing News if he knows that he has become famous, Fuman said he doesn't. And has he thought about what happens after all the attention dies down? "When it's over, it's over. I just want to study well," said Fuman.